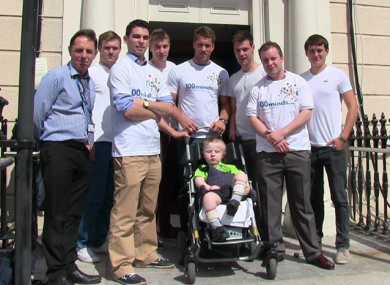 Dominic Ryan (centre) with fellow founders of 100 Minds outside Temple Street Children's Hospital. THE CONCEPT IS a simple, yet novel, one — selecting 100 keen undergrads to raise €1,000 each for Temple Street Children’s Hospital. 100 Minds is seeking to invoke the fundraising spirit of college students across the country, with all monies raised going directly to a hospital that has been caring for sick children for more than 140 years. Running over 12 weeks, from November until February 2014, the campaign encourages college students to demonstrate their entrepreneurial, creative and organisational skills for a worthy cause. One of the co-founders of 100 Minds is Leinster flanker Dominic Ryan. Having achieved his Bachelor of Commerce qualifications at University College Dublin, close to his club’s state-of-the-art training facilities, Ryan is delighted to be involved with a campaign he believes will benefit all stakeholders. He told TheScore.ie: “The main idea for 100 Minds came when Declan Egan, our chief executive, and a few of us sat down to chat last December. Undergrads will get practical experience of project management and of implementing an idea. They will have weekly meetings with their mentor, who is responsible for 10 students each, and we can provide advice and assistance. A number of meetings have taken place between Temple Street and 100 Minds founders. Ryan visited the Dublin hospital with some of his campaign colleagues in late August and says the few hours he spent there enforced the idea that the ideal beneficiary had been chosen for their first enterprise. Getting the name of the fundraising drive out there is crucial, he adds, with long-term ambitions including partnerships with other charities across the country. About 70 applicants have already been accepted but the drive is now on to reach the 100 mark. Many of the applicants have business and medical backgrounds but undergrads from all courses, and from all over Ireland, are welcome to apply. Ryan has featured four times for Leinster this season and is hoping to be involved in this weekend’s Heineken Cup clash with Castres. Having recently celebrated the milestone of his 50th Leinster cap, the 23-year-old is eager is enjoy his best ever season with the Blues. If that season involves a trip to Temple Street early next year to hand over a cheque for €100,000 it will surely prove one to remember. Email “Rugby star calling on undergrads to help raise €100k for Temple Street Children's Hospital”. Feedback on “Rugby star calling on undergrads to help raise €100k for Temple Street Children's Hospital”.